Thank you for once again being a complete and utter disappointment with your inadequate product and lazy journalism. When Canadian Running launched a few years ago, it pegged itself as “Canada’s version of Runner’s World.” I kid you not, I was at an expo where the sales dude sold me on that pitch alone. But that, in a sentence, was simply a load of crock! The one-year subscription I had with the magazine brought me no insight into the sport, its features were poor, and the product itself looked bush league. I think the only thing I really got out of it was a sample size of Jelly Bellys that I couldn’t even eat, so even that I didn’t get. But the other day when I was stocking up on gels and electrolytes at the Running Room, I noticed Canadian Running front and centre at the cash desk. Normally I wouldn’t have even given this magazine a second glance, but when I saw masters runner and fellow blogger Marilyn Arsenault on the cover, I impulsively threw it into the loot. Big mistake. From what I know, Marilyn Arsenault has an intriguing story. She’s an opera singer who started running in her mid 30s and somehow managed to conquer short distance after short distance. Last fall, at the age of 41, she beat the Victoria Half-Marathon with a course record of 1:15:39. And this fall, she’ll be taking on her first full marathon in New York. That paragraph alone tells you she has a story, but did Canadian Running expand on those bare bones details? No. Do we learn why she decided to run at 34? No. Do we learn how an opera singer went from belting out the high notes to becoming a record-breaking runner? No. Do we learn what her training strategy is, or whether or not she has freakishly fast DNA helping her to those finishes? Nope. Instead, we are inundated with the laziest form of journalism ever – Q&As! I don’t know about you guys, but for me, there is nothing worse (okay maybe there is, but going for dramatic effect here, work with me) than picking up a magazine and being intrigued by an article featured on the cover, so intrigued that you fork over the $5 for said magazine, and then when you get home and finally crack open the magazine to the article that had intrigued you in the first place, you are left sullied with a disappointing, lazy, nonsensical, uninformative Q&A. Seriously? Are you kidding me? You couldn’t have put just a few more minutes into actually writing a real story? a good story that would actually engage your readers? Really? One word: Bush. Needless to say, my disdain for the magazine has stayed intact. My dollars are much better served in Runner’s World where I actually do learn something about this sport I do so love and where I actually do read interesting, intriguing, well-written stories. I’ve kind of been slacking off on my Tuesday runs in the last month and have been starting to feel a little guilty about it, so I wanted to squeeze in a run today, but because of time constraints, I had to do it on a treadmill over lunch, which is most definitely not my first choice. Beyond the fact that I pretty much loathe gyms and that I find treadmills the ultimate in snoredome, today just about killed me. My legs were burning, like literally burning with every stride I took, my eyes were glued to the timer, willing it to go faster, my heart, I’m sure it was racing, and my face and feet, post run, were beet red. So if we take the blood sugars out of the mix, I’ve only got two explanations as to why my run was so horrendous: 1) I should have, in fact, taken today off given that I went out harder than was needed on Sunday, or 2) It was just another symptom of my treadmill despise. Thoughts…..get something great to watch in TV say the Home and Garden station or discovery or even your favourite soap, then your obsession with time will disappear! Also, The Running Magazine should hire you! and in the future peruse the article while standing in line and then you will know whether you want to spend the $5 or not. Magazine’s are funded mostly by their advertisers; with the content they have sounds like they won’t be around too long….hope they read your blog! Canadian Running must really be awful if it is worse than Runners World! 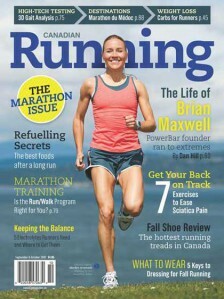 Nothing wrong with Runner’s World. I love that magazine and faithfully read it cover to cover when it comes every month.